AAAAAAAAAAAAA THIS IS THE BEST. THIS. IS. THE. BEST. EVER. Hell yes the return of Rise of the Brave Tangled Dragons but now it's Rise of ... Ice I guess. 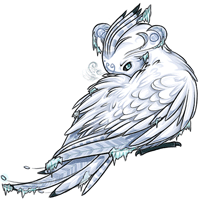 *sobbing* I love this pet so freaking much. I love these two characters, and I love them together, and I love that this story actually ties everything together so beautifully. Freaking amazing job, Queenie!! Congrats! Amazing art, love the two together, and the profile is really nice! Aaaaahhh i love this ship! Great job and congratulations! As soon as I saw "Fractals" and that the pet was glacier, I immediately launched into that line from Let It Go. xD; A very cute fanpet-- I like!! !